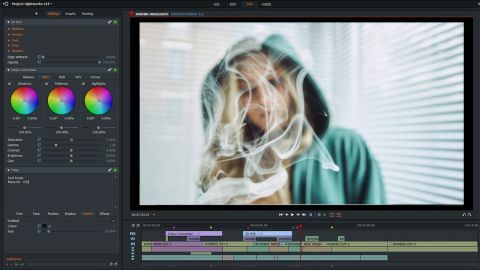 By far the most powerful free video editor around, Lightworks democratizes filmmaking by putting premium tools within reach of everyone. Lightworks is a remarkably powerful video editor, packed with professional quality tools that will make your clips shine. It's fast, flexible, and once you get used to its unusual workflow you'll find it remarkably easy to use. Whatever kind of project you have in mind, Lightworks can help you achieve it. If you simply want to trim a video to size, or combine several short sections of footage before uploading them to YouTube, Lightworks’ well designed timeline will help you get the job done in moments. Once you’re done, Lightworks has preset profiles so you can export your work in the right format for your chosen video-sharing site automatically. Equally, if you’re working on your own short film and need an advanced tool for post-production, Lightworks is packed with everything you need to get your audio and visuals just right. Real-time effects and color correction help you achieve the perfect look, and complex rendering and encoding processes take place in the background so you can continue working while they complete. As you might expect, it will take a little while to master Lightworks’ powerful toolkit. This is no mere Windows Movie Maker substitute, and its professional roots show in its interface, which borrows terms from the world of tape-based filmmaking. You begin by creating a project and setting a frame rate for the finished video – probably 30fps or 60fps. You’re then ready to get to work. Lightworks lets you record video directly from cameras, and import existing clips (both audio and video). Once you have all your resources, you can start adding them to your timeline to create your first cut. It looks intimidating at first, but is surprisingly intuitive once you’ve spent some time experimenting. Lightworks is packed with advanced realtime effects to help you perfect your video, including color correction, blurs and masks. There are dozens of preset effects, or you can create your own manually. The professional edition of Lightworks was used to edit box office hits including Shutter Island, Pulp Fiction, The Departed, 28 Days Later and Mission Impossible. Now it's your turn.